The Jungle is Melbourne's premiere playcentre, with incredible facilities to elevate your childs party to the next level. Our playcentre has something for everyone - from newborns to knee-highs, from parents to parties, The Jungle is an incredible place for children to explore, learn and discover. We welcome children and parents daily to experience our jumping castle, themed rooms, playground, cafe and more. We cater for parties, mothers groups, and have a special, safe environment for babies & toddlers. Pop into The Jungle today and see what all the kids are talking about! From birthday parties to playgroups, our under 3 play area is bursting with incredible experiences, from ball pit and soft toys to cubby houses and beautiful animal displays. Our custom designed party rooms each feature VIP seating, and your choice of Magical Dreams, Rumble Jungle, Funny farm and Dino World all within easy access to the playground. While the kids play, relax in our open and friendly cafe. We provide food and drinks for your function, so feel free to choose from our gourmet menu selection. Jam packed with fun, there's something for the whole family at The Jungle. Added to the huge three-tiered climbing frame, there's a carnival slide, ball pond, tunnels and flying fox. 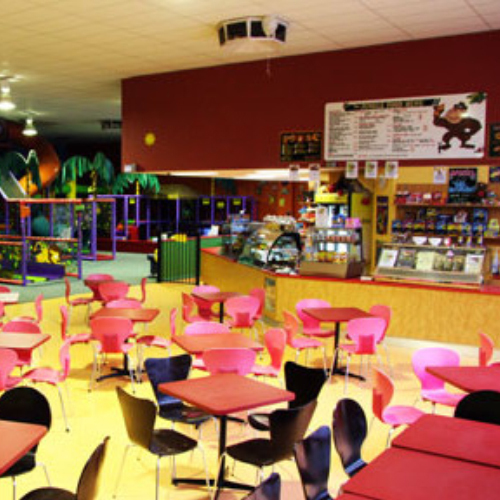 Plus discover soft play areas for little ones, dedicated zones for under 3s and more. Throw in beautiful themed rooms, jumping castle and more, and you have a beautiful, safe and clean environment for children to explore, experiment share and remember. And when we say the whole family, we mean adults too! We provide all your favourite magazines; perfect for relaxing with a great coffee in the Jungle Cafe. Plus, don't miss our special activity sessions for young children held Monday to Friday during school holidays. All included in price of entry! From the ball pit to the jumping castle and play structure, our playcentre keeps the kids active, healthy and entertained all day long. Our toys, our equipment and our food is all chosen to meet Aust. standards for hygiene & safety. While the kids play, the parents can unwind in our relaxing cafe, providing coffees, fresh snacks and lunch. Come down every day from 9:30am, for more details click here .